ESC Radio Awards – Il Volo, Polina Gagarina and Loïc Nottet win big! Fresh from their respectable third placing at this year’s Eurovision contest, Il Volo have another success to boast about in their own right – They’ve been awarded Best Song and Best Group at the ESC Radio awards, with Polina Gagarina and Loïc Nottet winning Best Female Artist and Best Male Artist respectively. ESC Radio, Europe’s most popular Eurovision Radio Station, opened up the votes for their awards to listeners for the 9th time this year, and with over 25% of the vote in the Best Song category, Il Volo’s Grande Amore easily beat Loïc Nottet’s Rhythm Inside who still commanded over 19% of the total vote. Polina Gagarina’s A Million Voices was the third placed song with 8% of the vote. Loïc Nottet still came out victorious in the awards, easily winning Best Male Artist with over 32% of the vote. The winner of the Eurovision Song Contest, Sweden’s Måns Zelmerlöw was 2nd in the listener vote with almost 27% of the vote, whilst Australia’s Guy Sebastian came in third with just over 14%. Loïc Nottet’s victory is notable in that it is the very first time Belgium has won an ESC Radio award in it’s 9 year history. For the category of Best Female Artist, Russia’s Polina Gagarina easily beat out Latvia’s Aminata, securing 23% of the vote over Aminata’s 12.6%. Third place was hotly contested – with Serbia’s Bojana Stamenov , at 11%, just beating the 10.8% of votes for Nina Sublatti of Georgia. 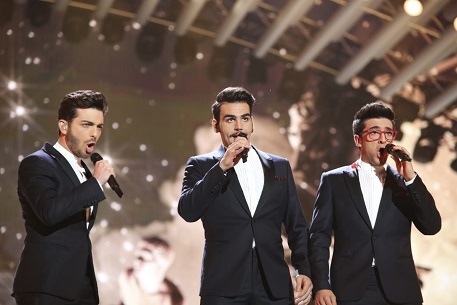 In the Best Group category, Il Volo more than doubled the vote against their nearest rival, Elina Born & Stig Rästa of Estonia, with the Italian trio obtaining over 37% of the vote versus 18% from the duo. Another duo managed to win 3rd placed in the awards, with Norway’s Mørland and Debrah Scarlett winning just over 11% of the vote. Voting was conducted from 6th to 14th of June 2015, and not only included participant countries from Europe and Australia, but also North and South America. To see how your favorite artist did, full voting results can be found here. Ever since I heard Constantinos Christoforou’s first notes of “Gimme” in 2001 I was one hooked Eurolover. I first attended ESC in Oslo and remember how electric the stadium atmosphere was. I remember how much hosting the contest completely changes a city and it’s people and was so hooked I’ve gone back every year since. When you’re an Australian in a very European backyard you come across a lot of looks of bewilderment &amp; surprise but the welcome you get from Eurofans is unforgettable. Valentina Monetta’s "Crisalide" is basically my soundtrack in life but Marija Serifovic’s "Molitva" is my favorite and most memorable winner.